The Liberal Democrats' manifesto will include a pledge to hand drugs policy from the Home Office to the Department of Health, Nick Clegg has said. His party would also investigate cannabis legalisation experiments in some parts of the United States. 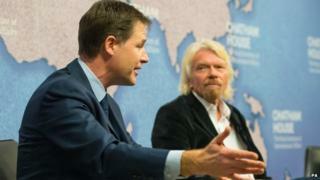 Mr Clegg spoke at a joint appearance with Virgin founder and drug law reform campaigner Sir Richard Branson. The two men said the UK seemed "oblivious" to the "tectonic shift" in the West on drugs policy. Downing Street has previously insisted that the current drugs strategy is working, saying drug use in the UK was "plummeting" as a result of existing policy. The Lib Dems have long argued for changes to Britain's drug laws. At his party conference in October, Mr Clegg described the current approach as "idiotic". The deputy prime minister renewed his attack on the current drugs policy in a speech in London alongside Sir Richard. He said the "war on drugs" had failed, and announced his party would establish a review to assess the effectiveness of cannabis legislation experiments in US states like Colorado and would allow doctors to sell the drug in the UK for medicinal use. The Lib Dems said their proposals were "the most far-reaching drug reform policies ever put forward by a major political party ahead of an election". Where do the other parties stand? Conservatives: Opposed to decriminalisation of drug use, which they say would be the wrong approach. Want to stick to the current strategy that is "working". Labour: Also against decriminalisation. Would ban the sale and distribution of so-called legal highs. UKIP: Party leader Nigel Farage has said he supports the idea of a Royal Commission on drugs policy to examine the alternatives to existing policy. Green Party: Decriminalise cannabis and axe prison sentences for possession of other drugs. Plaid Cymru: Encourage a debate on future of drug enforcement laws. Favours the decriminalisation of cannabis. Supports an evidence-based impact assessment of existing drug laws. SNP: Drug policy should be devolved to Scotland to allow an "integrated and coherent approach" to issues that affect Scotland's communities. Mr Clegg pledged to end the "nonsense" of jailing people for possessing small amount of drugs for their personal use, and say young people should not be penalised in later life because of a criminal record. "If this was your child and you found those drugs would you go to a doctor or police officer to help them? I think nearly all of us would call the health expert," he said. "And, in the same way, I just don't think it is right for us as a society to write off these young people who haven't hurt anyone else, just made the wrong choice, so early. "We need to put an end to this ludicrous situation. Our focus should be on getting them the help they need, not punishment, so they can go on to realise their ambitions and make a positive contribution to society." The Liberal Democrats say they would develop "diversionary programmes" to take drug users out of the criminal justice system. In a joint newspaper article, Mr Clegg and Sir Richard said the global war on drugs had been an "abject failure", with criminals making "unimaginable levels of profit" from the illegal market. They called for British pilots of the approach taken in Portugal, where possession of drugs was turned into an "administrative offence", sending those caught with drugs for personal use to a "dissuasion board" rather than facing prosecution. "The Portuguese system works, and on an issue as important as this, where lives are at stake, governments cannot afford to ignore the evidence," they added. The findings of a Home Office report, commissioned by the Lib Dems to compare drugs policies in different countries, prompted a row at the top of the coalition last year, with the Lib Dems accusing the Conservatives of "suppressing" the report's release. Norman Baker, a former Lib Dem Home Office minister, said the report should end "mindless rhetoric" on drugs policy but Prime Minister David Cameron said the research did not offer "specific conclusions" and that he did not "believe in" decriminalising drugs.